On lightly floured surface, roll dough about 1/8-inch thick. 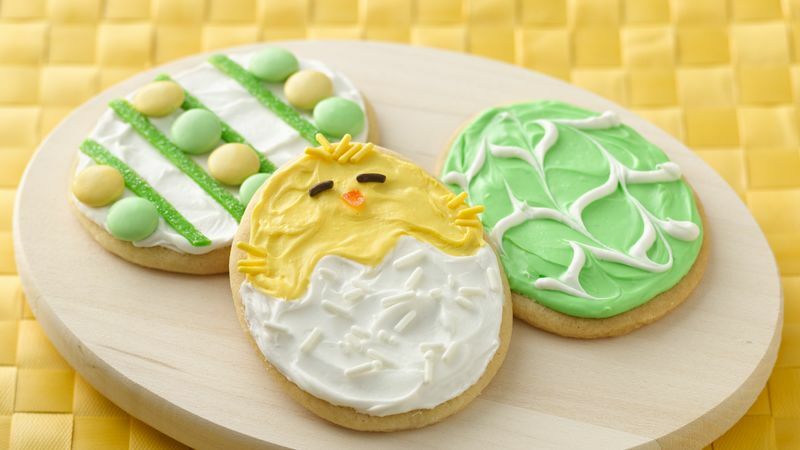 With 3-inch egg-shaped cookie cutter, cut out eggs; place 1 inch apart on ungreased cookie sheets. Bake 7 to 9 minutes or until edges are light golden brown. Cool 1 minute; remove from cookie sheet to cooling racks. Cool completely, about 15 minutes. Frost and decorate. Marbled eggs In small bowl, stir 1/4 cup frosting and 1 to 2 drops favorite food color until well blended. Frost cookies with contrasting colored frosting. Pipe three lines colored frosting onto each egg; using toothpick pull through frosting for marbled appearance. Candy designs Frost cookies. Decorate with candy strips, jelly beans or candy-coated chocolate candies. Easter chicks In small bowl, stir 1 1/4 cups frosting and 2 to 3 drops yellow food color until well blended. Frost top half of each cookie with yellow frosting and bottom half with white frosting. To decorate, use black sprinkles for eyes, yellow sprinkles for feathers and pieces of orange candy slices for beak and feet. Find gel food colors in the baking suppy area of craft stores and in larger supermarkets.